AS MANY AS a million spectators turn out for the Macy’s Thanksgiving Day Parade. Another 200,000 show up the night before to watch the enormous balloons inflate. Keeping New York City safe on an ordinary day is challenging enough; locking down a massive parade route is all the more so. But the New York Police Department has recently deployed a new secret weapon to counter body-worn bombs: A team of Labrador retrievers who have graduated from patent-pending “Vapor Wake” security training. These are good dogs. Researchers developed Vapor Wake dog training at Auburn University’s College of Veterinary Medicine, in part as a response to Richard Reid’s attempted shoe-bombing in 2001. For the last decade or so, Auburn has honed a process to breed and train labs that can detect faint whiffs of explosive particles in the thermal heat plumes humans create as they walk. Combining genetics with rigorous training, the dogs learn to identify different levels of explosive odor, so they can tell the difference between, say, a concealed firearm and multiple pounds of explosives. That level of discernment matters, especially in a situation like the Thanksgiving parade, where the Vapor Wake dogs will need to ignore the weapons law enforcement will be carrying. Vapor Wake dogs are born at Auburn, receive environmental and socialization training for their first year, and then receive specific Vapor Wake training through VWK9 until they’re about 18 months old. Then they’re paired up with a handler for a seven-week joint behavioral training course. Finally, the dogs are ready to help save the world. Or in this case, one of the world’s biggest parades. The dogs work efficiently and calmly in large crowds, and can rapidly screen dozens of people at a time. And if they smell something, they follow the scent trail. Last year, the NYPD deployed eight Vapor Wake dogs for the parade. This year, they’ve upped the pups to 14, according to Paul Hammond, the president of VWK9, the Alabama-based company that works exclusively with Auburn on the commercial side of Vapor Wake. Vapor Wake dogs don’t replace traditional bomb-sniffing dogs, which focus on assessing stationary objects like baggage and vehicles. Instead, Vapor Wake pups are trained to have their heads up, sniffing the air. 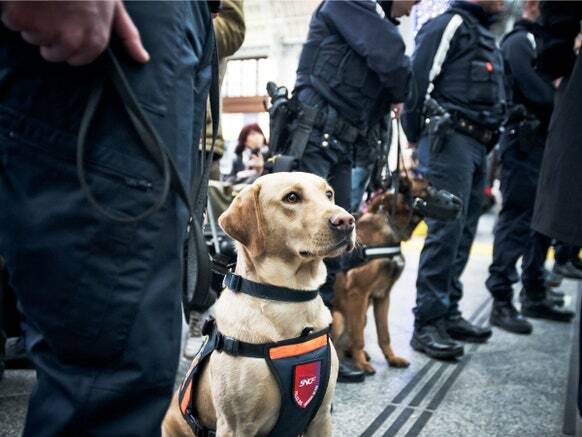 One dog can sniff out someone wearing or carrying a bomb in a sea of tens of thousands of people. Major police departments like New York and Chicago have already incorporated Vapor Wake dogs, as have railroad police forces like Amtrak and ViaRail in Canada. The dogs work at concert venues and sports stadiums, at Disney World and Disneyland, at megachurches, and even at Apple’s major events and product launches. Because the technique requires refined sniffing, VWK9 reevaluates and re-certifies every Vapor Wake dog every year, whether they are still part of the company’s contract business or are owned by other institutions. “No matter who you are, if you’ve got Vapor Wake dog, they have to be evaluated by us on a yearly basis,” Hammond says. They may not have the brute power of the sand-filled dump trucks and heavy weapons teams that will also be out in force at the Thanksgiving Day Parade in New York, but Vapor Wake dogs provide a more elegant approach to anti-terrorism work and crowd security. It doesn’t hurt that they’re they cutest canines on the block—no disrespect to the Snoopy balloon.